THE MOST POWERFUL NUTRIENTS ON THE PLANET—ALL IN ONE JAR! 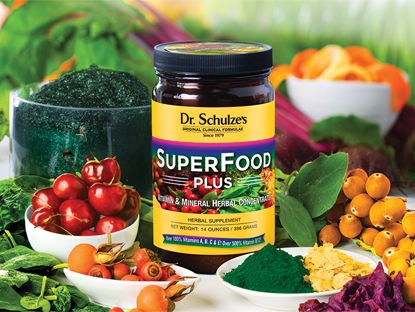 Dr. Schulze’s SuperFood Plus nutrients blast your bloodstream with a rich supply of nutrients that increase energy, vitality and strength. Most people today live on a diet of over-processed and over-cooked food, not to mention coffee, sugar, chocolate, junk food, prescription drugs and alcohol. Our environment is more toxic, and has more chemical pollutants and less oxygen in it, than ever before. Most of us suffer from lack of exercise, lack of sleep and excessive stress. This constant bombardment that we call “modern living” devours nutrients like a raging forest fire with a 100-mph tailwind. A lack of nutrition in your blood can cause everything from low energy and a weak immune system to premature aging and virtually any disease. Nutrition is what builds every cell, every organ and every metabolic chemical in your body—it’s what YOU are made of. 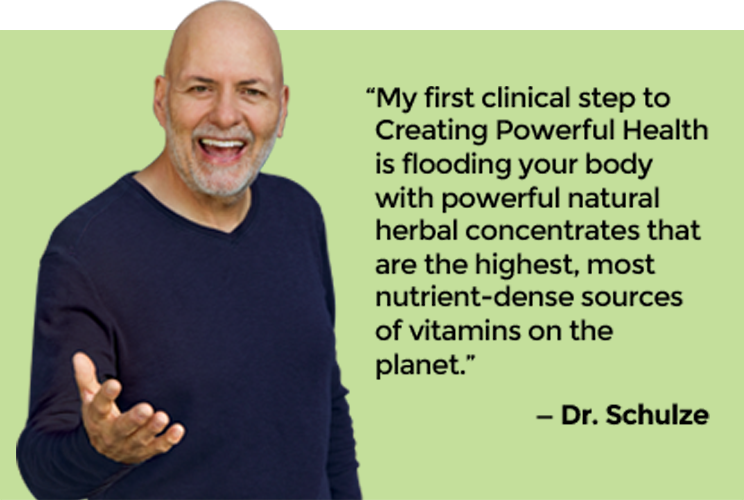 Having a rich supply of nutritional supplements in your blood gives you energy, vitality and strength, protects you from disease and illness, and if you get sick, speeds up your recovery dramatically.